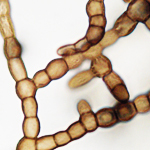 The US Department of Energy Joint Genome Institute (JGI) today released the full, annotated genome sequence of Baudoinia compniacensis, a fungus we discovered that was featured in the June 2011 issue of WIRED MAGAZINE. This extremophilic sooty mold is the prominent pioneering species in the primary successional community known as “warehouse staining”, where darkly pigmented microbes form dry biofilms on outdoor surfaces periodically subjected to low level exposure to ethyl alcohol vapour, such as those around distilleries, spirit maturation facilities (“bond warehouses”) and commercial bakeries. Sporometrics worked closely with JGI throughout the project, developing protocols and supplying high quality genomic DNA and total RNA for the sequencing project. On the July 8, 2011 edition of AIHA’s Safe and Sound podcast hosted by Craig Sorrell and Katherine Grandstaff, they speak with Dr. James Scott about a mystery fungus that grows around whiskey distilleries. Dr. Scott’s discoveries were recently highlighted in the June 2011 issue of Wired Magazine.